The character of the inscription and the figure, the headdress and upper parts of which (including the arms against the sides) are echoes of the Egyptian Bes type1, all suggest a later Imperial age, so-called Gnostic image. The figure is the sculptural counterpart of the types known best from the gems which are included in this category. 1 For the Bes figures from which this confused adaptation stems compare A. De Ridder, Coll. De Clerq, III, pl. XXXII, no. 212 and in Egyptian Dynastic art, British Museum objects numbers 12591 (XIX-XXth Dyn.) 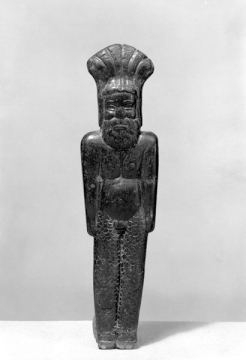 and 57330 (top of a sceptre-staff, XXVIth Dyn); also the Bes-Harpocrates- Somtous figure in the Musée de Mariemont (Cat., p.44, no. E.104, pl.11). Purchased by John Soane at the Charles Yarnold Sale (auctioneer Mr. Southgate), 11 July 1825, Lot 144, A singular figure with Grecian inscription on the back £0.14.0.